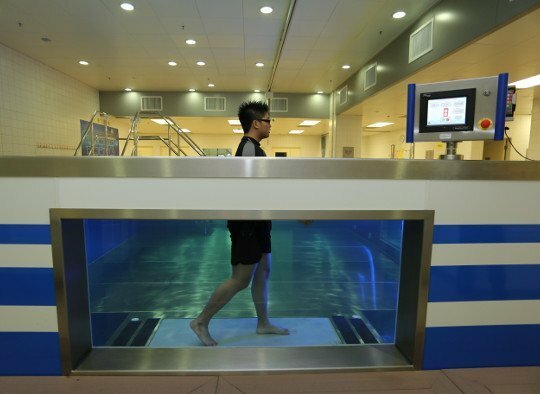 We believe that the underwater treadmill is the next step in active rehabilitation. Because of buoyancy, resistance and hydrostatic pressure of the water, the patient can start underwater walking exercises almost immediately. Our EWAC movable floors make it possible to house an integrated underwater treadmill, meeting the highest norms regarding usability, adjustability and operational stability. When mobility is key or you don’t have one of our floors, we offer a drop-in treadmill. For pools without a movable floor, our drop-in lifting system will still allow you to change depth while running in order to provide the best exercise environment. Aquatic treadmills are the pinnacle of underwater exercise equipment, and can be used for low impact obesity treatment. The strict walking rhythm it imposes has added value in neurology. EWAC Medical has been designing and building movable swimming pool floors for over 25 years and has successfully finished more than 1.000 projects worldwide. We continually work on improvement and innovation. Even though Aquatic treadmills are a relatively new development, experience with these products is increasing rapidly. Underwater treadmills can be integrated in any of the current EWAC Medical products which makes our proposition incredibly competitive. 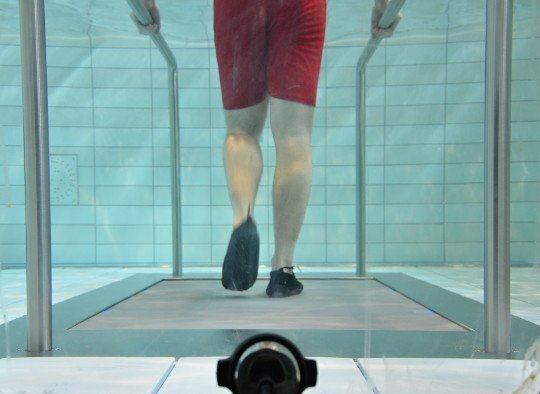 Exercising on an underwater treadmill combines the favourable effects of water during the execution of stationary walking exercises. 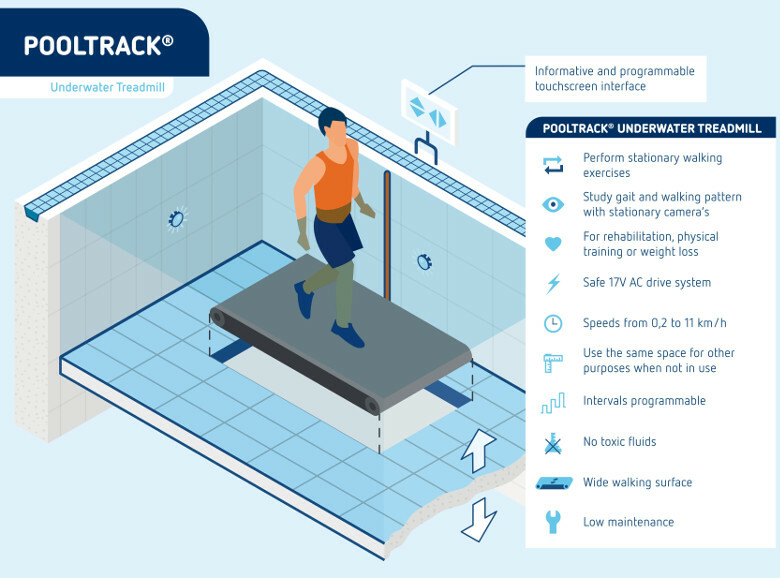 An underwater treadmill turns the pool into a virtually endless pool; the patient does not have to turn at the end. Water has lots of favourable effects on the rehabilitation process. Because of the buoyancy, weight bearing in the legs is reduced, which makes it easier for an injured patient to exercise. At the same time, the warm water makes the ligaments more elastic and therefore range of motion is increased. As an added bonus, submersion in water reduces pain sensation. All these effects added together makes the underwater treadmill an excellent piece of exercise equipment, that can be extremely useful for obesity treatment, sports endurance training and general rehabilitation of leg problems. The strict rhythm imposed by the underwater treadmill can be very helpful in treating neurological patients. 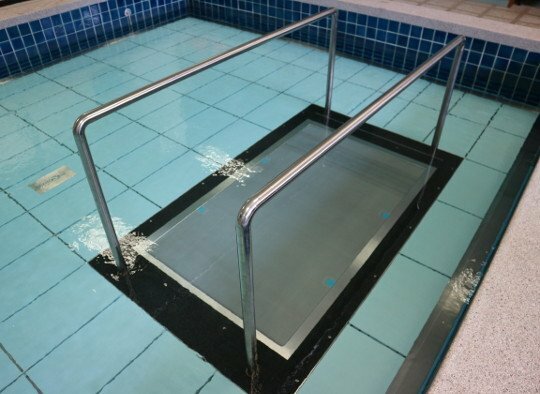 Integrating an underwater treadmill in a movable swimming pool floor enables the user to adapt the loading on the patient’s lower extremities to the stage of the rehabilitation process. A completely integrated underwater treadmill makes it possible to perform walking exercises at different body loads. It is possible to remove the parellel bars, which clears the whole area of the movable swimming pool floor for other hydrotherapy methods. 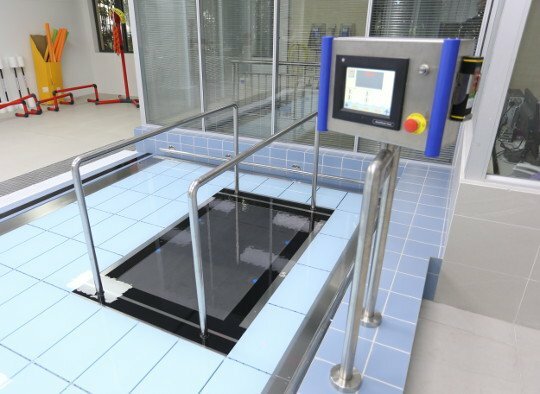 The underwater treadmill can be fitted in any new pool floor, but can also be excellently fitted in existing EWAC Medical movable swimming pool floors. EWAC Medical does not only supply underwater treadmills, but also contributes actively in acquiring and dispersing knowledge about hydrotherapy. We are also actively involved in developing new underwater exercise equipment for rehabilitation purposes. On this page you will find more in-depth information about all the aspects that come into play when applying an underwater treadmill. Exercising on an EWAC Medical underwater treadmill offers a great number of advantages. Underwater camera This special underwater camera enables the therapist to track the movements of the patients, and if necessary record the movements for further analysis. By comparing images from multiple sessions one can get a clear picture of the progress made by the patient. Counter current unit or Jetstream Countercurrent unit or jetstream. A jetstream offers exercise resistance to the patient moving against the flow. A wall nozzle produces a strong water jet which is aimed at the patient, and depending of the required exercise load, can be softened with air. Underwater lighting Underwater lighting is highly recommended to improve the sight through, for example, an underwater window. The lighting can be either delivered in monochrome or in colours. Observation windows Observation windows can be placed in regular pools as well as modular pools. Observation windows enable the therapist to supervise the executions of the patient optimally. The integrated underwater treadmill is completely flush with the adjustable pool floor. Weight bearing of the patient can be adjusted by lowering the adjustable floor. From young children to adults, in any stage of rehabilitation, the combination of an underwater treadmill with an adjustable floor offers an excellent exercise environment. When the treadmill is not used, removing the parallel bars frees the entire area of the exercise pool for other underwater exercises. 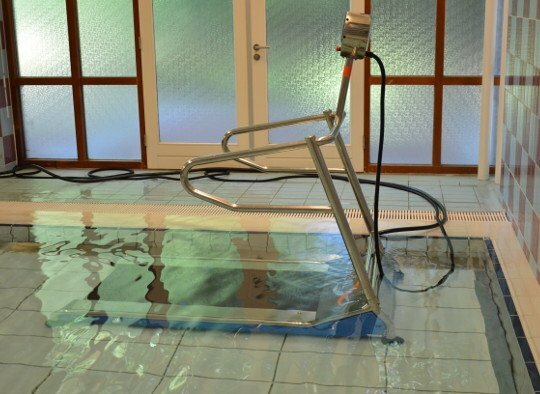 The underwater treadmill can be fitted in any new adjustable pool floor, but can also be excellently retro-fitted in existing EWAC Medical adjustable floors. For existing pools with a fixed depth the drop-in underwater treadmill is an excellent piece of exercise equipment. The freestanding underwater treadmill can be placed in any position on the bottom of the swimming pool. The drop-in underwater treadmill turns the pool into a multi role, low impact exercise environment. The underwater treadmill can be completely removed out of the pool, to clear the available space for other underwater exercises. Both underwater treadmills meet the demands set in the ISO-norm 13485. 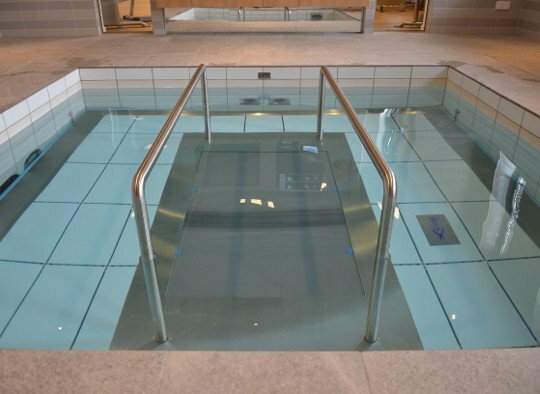 An underwater treadmill designed to fit perfectly in one of our movable swimming pool floors. An underwater treadmill able to be moved in and out of the pool regardless of its environment. 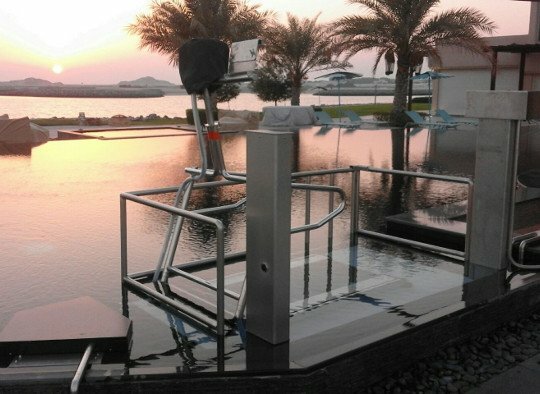 A lifting system specially designed for the drop-in underwater treadmill to be lowered in any aquatic environment.